I finally saw La La Land! It’s basically a crime that I hadn’t seen it before since I’m living in Los Angeles. I’m not typically drawn towards musicals, but La La Land was absolutely dazzling. ⭐ It was such a love letter to LA and reminded me of all the little things I love (and don’t love) about living here. The film also highlighted so many iconic locations, such as Griffith Observatory, the El Rey Theatre, Colorado Street Bridge, and Angel’s Flight (sidenote: Angel’s Flight has actually been abandoned since 2013 and the derailed trolley car is covered in graffiti). So many movies are filmed in Los Angeles and use the city as a backdrop, but La La Land was a bit different because it captured my love for old Hollywood. 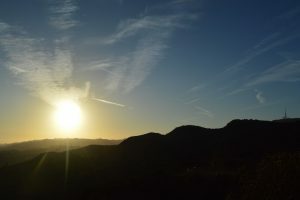 Griffith Observatory sits on the edge of a hill that overlooks Los Angeles, and the rooftop and telescopes enable you to see the entire city, including the skyscrapers downtown, the Santa Monica mountains, the world-famous Hollywood sign, and more. You also have an incredible, panoramic view of all the sprawling neighborhoods that make up LA. I decided to go a little before dusk and catch the sunset, and it was beautiful to see the city below lighting up as the sky was going dark. Not only are the views breathtaking, but the architecture of the building is beautiful too. The interior and exterior designs are really unique, and because the Griffith Observatory was built in the 1930’s, the building’s art-deco style is extremely prevalent and easy to recognize. The observatory was closed between 2002-2006 for construction and exhibit renovation, but still retained its vintage exterior. My favorite part of the interior is a painted rotunda through the entrance of the building. 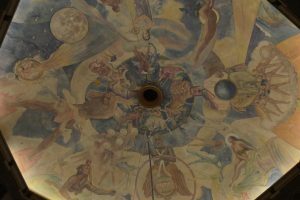 The rotunda is decorated with a gorgeous, detailed mural by Hugo Ballin and depicts the history of science along with a bit of mythology. Beneath the rotunda is the Foucault Pendulum, which swings continuously. Los Angeles can be an expensive city, and sometimes it’s difficult to find affordable means of entertainment. 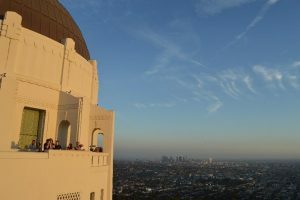 The Griffith Observatory is absolutely free, including the exhibits, telescopes, tours, and even parking. The only thing you may end up purchasing is tickets to a planetarium show or a few quarters for one of the coin-operated telescopes. 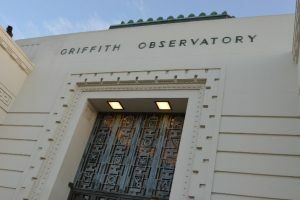 A little history: The Griffith Observatory opened in 1935, and its founding begins with Griffith J. Griffith. As a journalist, he reported on the mining industry and eventually was employed by several mining syndicates, which amassed him a fortune. 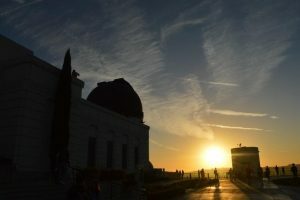 Despite being the beloved namesake of Griffith Observatory and Griffith Park, I learned that his personal life was actually very dark. He had a history with domestic violence, and once shot his wife in the face. While she survived the assault, her face was permanently disfigured and she became blind in one eye due to the shooting. Although this attack was an attempted murder, Griffith only had to serve two years in jail. Not to discredit his philanthropy work, as I think it’s admirable that he left his funds to build a public observatory, but I thought his negative reputation was interesting. Griffith is such a prominent historical figure in LA, with an entire park named after him, and yet his attempted murder and stint in jail doesn’t seem to be a widespread topic of conversation.